and gain control over your life and increase your freedom with hypnotherapy for anxiety on the Main Line. Anxiety is a pattern, or a habit that at one time served you. Many people begin to believe it is just “who they are.” I ask you to challenge this belief! Using hypnosis to help anxiety is very effective. Driving anxiety is no different. In the last year, I have seen an increase of clients with driving anxiety. With studies in todays neuroscience, scientists are seeing what is happening in the brain and finding that with plasticity (that every brain can change at any age) we can interrupt existing patterns of anxiety and replace them with feelings of calm. I have been working with clients for ten years to gain control over their anxiety and their mind. I have helped both kids and adults to leave a more relaxed and in control life. I offer a unique, evidence-based solution to overcoming anxiety based in cutting-edge neuroscience and research and blend it with the power of hypnosis. Anxiety is expressed in many ways for different people. In our sessions you will learn how the amygdala and cortex (both are part of the brain) are essential players in the neuropsychology of anxiety. The amydgala is the primitive part of the brain, and oftentimes, when this part of the brain processes fear, you may not even be aware of or understand why you are afraid. By comparison, the cortex is the center of “worry.” That is, obsessing, ruminating, and dwelling on things that may or may not happen. I will teach you how to manage fear by tapping into both of these pathways in the brain. By using hypnosis, which addresses the subconscious part of the mind, you will more easily gain control over the patterns of anxiety that has kept you stuck for so long. My method is a blend of conscious and subconscious methods to interrupt this pattern that will rewire your brain and have you feeling more calm. No matter how long you have experienced your anxiety you can overcome it. I have watched my clients interrupt this pattern for years. There is no reason to continue to struggle. You can learn to control your thoughts and shift your emotions in just a few sessions of hypnotherapy. Hypnosis is an extremely powerful tool to eliminate your anxious patterns. 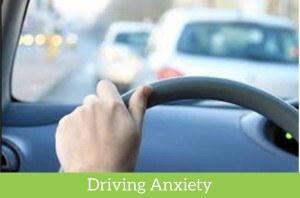 You Can Be Free of driving anxiety! Most people overcome their anxiety in 3 or 6 sessions. My program includes the sessions and exercises and audios to use at home.